Abstract. An extension of mvmeta, my program for multivariate random-effects meta-analysis, is described. The extension handles meta-regression. Estimation methods available are restricted maximum likelihood, maximum likelihood, method of moments, and fixed effects. 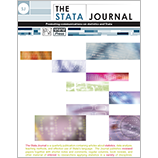 The program also allows a wider range of models (Riley’s overall correlation model and structured between-studies covariance); better estimation (using Mata for speed and correctly allowing for missing data); and new postestimation facilities (I-squared, standard errors and confidence intervals for between-studies standard deviations and correlations, and identification of the best intervention). The program is illustrated using a multipletreatments meta-analysis.